We are well under way with the demo phase at our E 8th Street project in South Boston. The interiors of both properties have been gutted down to the studs and three layers of siding have been stripped off the exterior. In case you missed the "before" pictures of these properties, check out this post! With few load-bearing walls, we were able to open up the space. Gutting the bathrooms exposed a lot of old plumbing that we will need to replace. This is one of many dumpsters the demo crew filled. As you can see, there were multiple layers of siding we had to strip off. The crew working on exterior side 3 of 4. 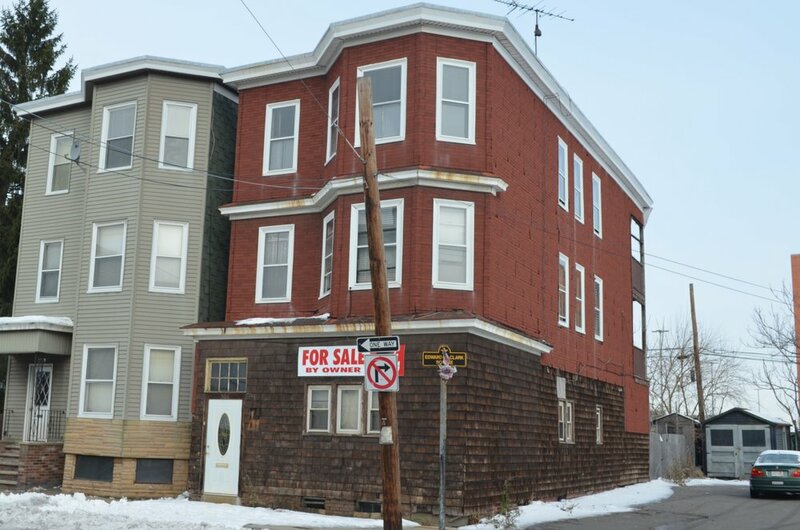 In late April, we aquired two side-by-side properties on East 8th Street in Southie. We will be turning these decrepit properties into two beautiful four-story townhouses. For both properties, we plan to gut the house, reconfigure the floorplan to create a dreamy master suite on the top floor, update the exterior, and choose high end finishes that will make buyers' jaws drop. 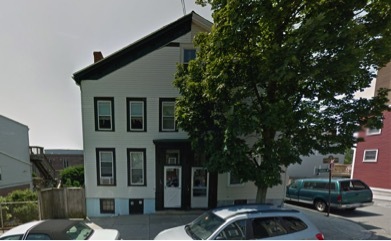 Both properties are in serious need of a facelift. The cramped kitchen layout needs to be re-worked. The bedrooms are small and drab. Our new floorplans will make maximize bedroom space. The existing bathrooms are dark and dated. The disorganized basement made it impossible to take advantage of the walk-out into the back yard. When we purchased this house truly ugly house in East Boston, we knew we might have signed on for more work than some of our previous projects. 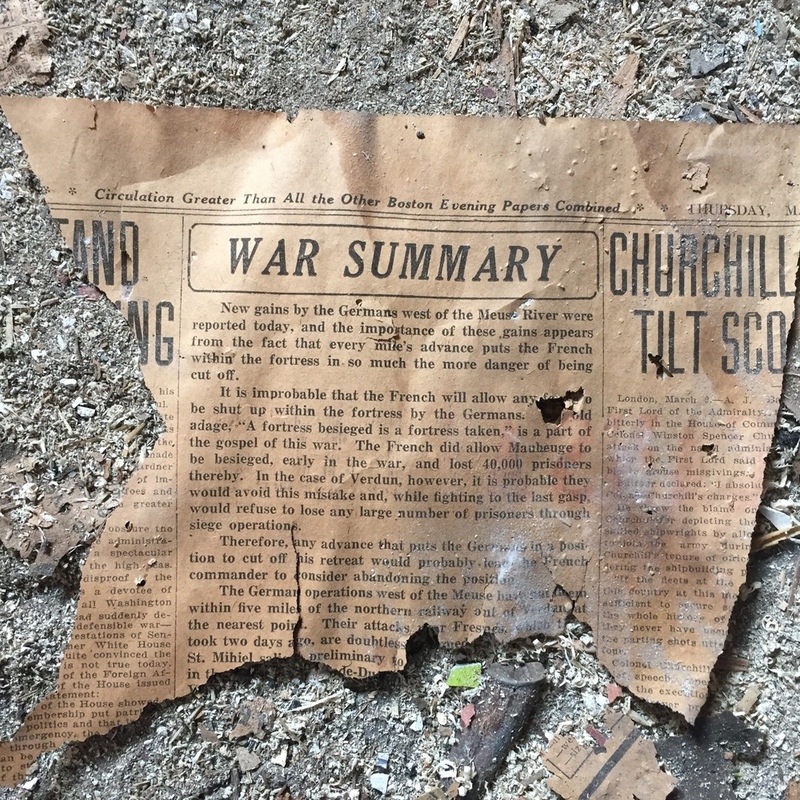 The foundation was cracking, an outer wall of the home was rotting away, the deck on the back of the house was unsafe to the point we could not walk on it, and the roof was in such bad shape that we could see sunlight shining through holes in the ceiling. With the help of a brilliant Brazilian craftsman, we were able to tackle the structural challenges of this house and turn it into a beautiful home. The home was sided with fake brick and worn-out shingles. The decks on the rear of the house were sagging and the fake brick exterior was peeling off the walls. Inside the home, so much had collapsed or decayed that it seemed nature was taking this building back. It goes without saying that this house was uninhabitable. To gain space in this home, we removed this extra interior staircase and built a staircase into the exterior decks on the back of the house. The new concrete in the upper right of this picture was piped into this basement through a 3 foot wide walkway between this home and the next door neighbors. In order to rebuild this exterior wall that had rotted away, we had to put up temporary bracing to prevent the whole building from collapsing - this was scary stuff. We purchased the Squantum Saltbox in April, 2016 and it had the toughest, most chopped-up layout of any house we purchased. In addition, the addition built in the 1950s turned out to be rotten once you exposed the wood and framing. And the plumbing system looked like a kindergarten science experiment. The original scope of work was to replace kitchens, baths, floors, paint and open up two walls. The new scope became a full gut rehab plus new siding. Opening the wall from kitchen to living room gives line of sight into the kitchen front the entryway. We reframed and re-plumbed most of this house. Careful coming out of the door. Hickory floors cost more but they're 40% harder than oak and owners love them. We're proud to showcase our company's new image and excited to share our content in a new way. Have a look around and let us know what you think - feedback is always appreciated!